Happy Birthday Warren Buffet! Since today is his 83rd birthday, I thought it appropriate to post an art reproduction example we did for the artist Dave Phillips and his wonderful pencil/graphite portrait of the Oracle of Omaha. Dave Phillips is an local Omaha artist who envisioned a series of portraits of great leaders in various industries: business, music, sports etc. The past few years have not been kind to Dave and an fireman’s accident left him unable to work. Through friends and colleagues word got to Warren about this exceptional portrait and after seeing the original Mr. Buffet gave Dave permission to reproduce and sell quality reproductions. This gave Dave the endorsement needed to continue with his sponsors, one of which was Hamilton Color Lab, to proceed with the digital capture and giclee prints. The journey of a new artist when they bring Hamilton Color Lab their first piece of art to reproduce is special and this was no exception. So much time, in this case hundreds of hours, goes into a piece of art that it’s almost like handing over a child to a new caregiver with the hope they will take care of your child as much as you would. Then there is the worry and anticipation of seeing the reproduction. Will is represent your art in the best way possible? Will the detail and color be captured accurately and faithfully represent the original? Will a customer recognize the reproduction as a copy, or will it almost pass as an original? Obviously each piece of art is different, and how a reproduction will translate to different papers is a unique depending on the medium. 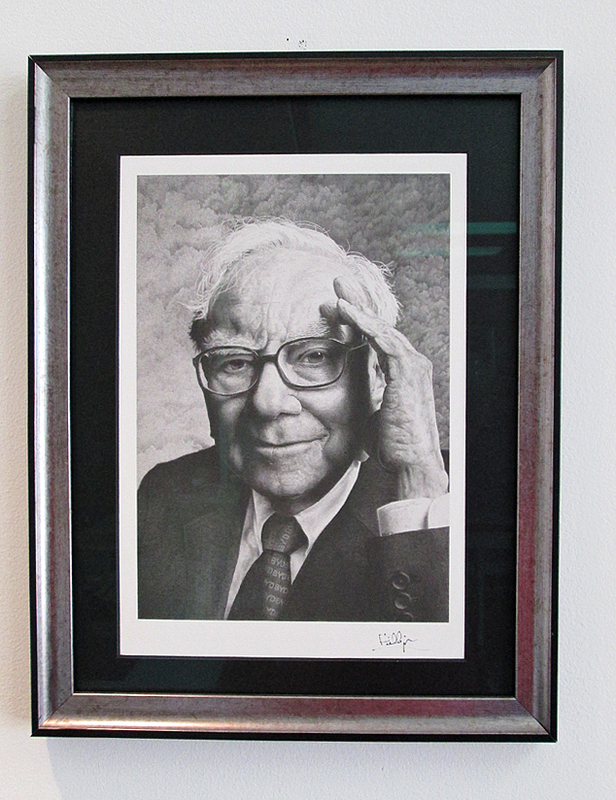 In the case of the Warren Buffet reproduction the original was created with graphite pencil on water color paper. The choice to print the reproductions on Velvet Cotton Rag paper using the Giclee process on our Epson 9900 was obvious. The result was nothing more than amazing. The digital capture using our special flat camera lens was able to pick up the finest detail strokes, maintain sharpness corner to corner without any lens distortion. Dave Phillips was hard pressed to tell the difference between his original piece of art and the reproductions. Warren Buffet was impressed enough with the results he signed six copies and gave his blessing for this representation of him to be sold by the artist. Dave Phillips was appreciative enough for our work that he signed the first copy and gave it to us and it now hangs in our lobby, not only an example of the quality of our art digital captures and printing capabilities, but to give recognition to an Omaha native who has brought attention to our great city of Omaha. On this day, August 30th, we say Happy Birthday Warren Buffet. Categories: Art Reproductions, Giclee Printing, Uncategorized | Tags: architecture, Art, art reproductions, arts, cotton rag paper, Giclée, graphite pencil, graphite portrait, illustration, nebraska, omaha, oracle of Omaha, pencil art, Portrait, printing techniques, Warren Buffett | Permalink.